Growing up my father was a huge red meat eater. He absolutely loved steak, burgers and stews. I on the other hand would chose fish and chicken if given the choice. To this day I still love grilled chicken over steak and sausage. However, my husband and two boys love red meat. When I say love, I mean really love red meat. In particular bacon is a favorite of theirs. If they could eat bacon at every meal they would do so happily and see nothing wrong with doing so. While I do love bacon, I have been encouraging my family to eat more chicken and fish. Luckily my two boys have discovered they love any type of grilled chicken. They get very excited when I take out the indoor grill and start grilling chicken. 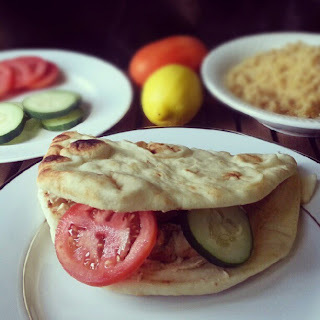 Last month I tried a new recipe for Chicken Shawarma from the August issue of Family Circle magazine, which with 35 grams of protein looked perfect for my active family. This recipe has 13 ingredients. It takes 20 minutes of prep and 10 minutes of broiling time and makes 6 servings. I had no problems finding any of the ingredients at my local grocery store and made no ingredient modifications. I chose to use naan instead of lavash bread. I love naan and use it frequently. Instead of broiling my chicken I used an indoor grill. The broiler on my oven has been broken for months, so obviously I am unable to use it. Using the grill was perfect for this recipe and I think it would work better than the broiler in the first place. It took approximately 10 minutes for the chicken thighs to cook on the indoor grill. I followed the remainder of the recipe as written. The chicken in this recipe turned out delicious. I think modifying the recipe to use the grill instead of the broiler was perfect. I would use this method again if I made this recipe a second time. My two kids really liked these sandwiches. The fact that they can be held was something that my kids really liked and the flavor of the chicken was delicious. Now that I'm not eating gluten if I was to make this recipe again I would eat it as a salad. The chicken would be great as a salad and would only need a very light vinegar dressing. Overall, a very easy and child friendly recipe. Love your blog - great ideas and recipes!! :) Found you through a Naptime Diaries link up! Now following via GFC and lookin' forward to reading more!! This looks good. Going to go check out the recipe. Stopping by from the MMMBH.